Good news to those unemployed professionals seeking for a job! 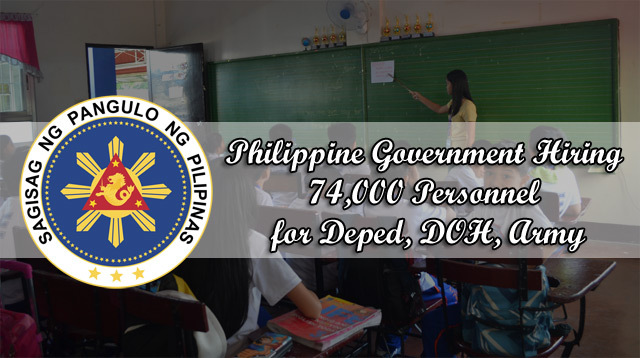 The Philippine government is hiring at least 74,000 teacher, health professionals, engineering personnel, and Army members. The Department of Education would employ 18,238 more teachers for Grades 1-10 and another 21, 858 senior high school teachers nationwide. According to Deped Undersecretary Jesus Lorenzo Mateo, K-10 teachers need to be licensed. For those who would teach senior high school, they are given 5 years to pass the licensure exam for them to be regularized. Applicants who would be hired will be compensated as much as Php 19,000, but they would not be given the choice on where to be assigned. Meanwhile, the Department of Health also needs to fill up 20,000 vacancies in hospitals and public health centers around the country according to Health Secretary Paulyn Jean Ubial. Ubial said they have already hired 23,000 various health professionals like doctors, nurses, midwives and dentists, but will need more. Interested applicants may submit their requirements to hospitals or health offices they would want to be affiliated with. The Philippine Army is looking for almost 14,000 people to fill in vacancies for officers, engineering units, and new recruits. Army spokesperson Col. Benjamin Hao said that once an applicant joins the training, he or she will take home more or less Php 16,000. Applicants may visit recruitment centers in Fort Bonifacio in Metro Manila, Camp Lapu-lapu in Visayas, and Camp Evangelista in Cagayan De Oro.